To change the default File As format used for new contacts, go to Tools, Options, Contacts options in older versions or File, Options, Contact options in Outlook 2010 and 2013. Outlook's Contact's offer a number of File As formats and this format can be used for the contact's name display in the Address Book. However changing the File As format on a large number of contact's is time-consuming when you need to change the contacts one by one. You can do it using VBA or a utility (listed below). The file as format options are shown in the screenshot. The VBA code sample supports all 5 formats. Along with changing the File As order, you can change the order Outlook assumes you use when you enter the name. This setting determines how the names populate the dialog when you press the Full name button. If the name order is wrong in FileAs ("Mary, Smith" when using last, first format), check this setting. If you choose Last First format you don't need to use a comma to separate the names when you enter them and First Last1 Last2 correctly puts the name in the middle position into the last name field, not the middle name field. Outlook will detect names separated by commas as Last, First format, regardless of the Fullname format setting. To test for a value (such as Company name) and use a different File As format if the value is empty, you need to use an If... Then statement. See Bulk change FileAs format to match Outlook's default setting for a version of this macro that reads the default setting in the registry and applies it to existing contacts. To use, select the Contacts folder in Outlook then return to the VBA Editor and press the Run button or F5 to run the macro. You can run the macro later by pressing Alt+F8 (after selecting the Contacts folder) then choosing the macro and pressing Run. To help eliminate errors, we have text files containing the VBA code samples available. To use, open the text file and Select all (Ctrl+A), copy then paste into the VBA editor. To save to your computer, right-click and choose 'Save Target as'. If you have a mix of contacts for people, with a value in the Fullname field, and companies, where the Fullname field is blank, you can replace the With objContact... End with code block with the snippet below. This code checks for a value in the fullname field and if it's blank, it looks for a company name. If a value is in the company name field, it's used in the FileAs field. If you need to switch the mailing address to the business address field (or from business to home address) you can check for a value in the business address field, and if not blank, copy it to the .MailingAddress field. Use .HomeAddress if you want to make the home address the mailing address. As with the code above, replace the With objContact... End with code block in the macro with the snippet below. I call this code sample my "super-duper bulk contact changer macro" because it's so easy to change it to work on other Contact fields. 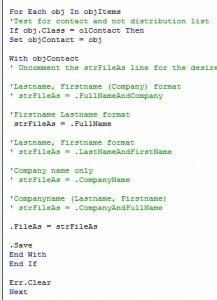 Simply replace section in the original macro that changes the FileAs field with other fields. For example, changing it to .Body = "" will erase text from the body, solving a problem Nox had syncing contacts to a smart phone. If the phone can handle some text, you could keep some of the text, replacing 1024 with the number of characters you want to keep. After pasting the code into the VB editor, the colors should be similar to the colors in this screenshot (and as seen in the code sample above). Any text shown in Red has an error in it. Note: this was written for an older versions of Outlook and is not needed with new versions. Use the Outlook File As Order custom form to change just the display in the Address book, from Last name first, to First name first or use the File As entry. This method will not change the actual sort order in the Contacts folder or format used on the File As field. Will return an error if there are distribution lists in the Contacts folder. This has the same options as you'll find in Tools, E-mail Accounts, View or change existing Address books, Outlook Address book properties, but also adds Last name first option and full File As format, including the Company name. Works on any contact folder - select the folder before clicking Run in the VB Editor or pressing F5. Leave the editor open and select another folder to use it on additional folders. The original code works on the default Contacts folder and many users asked for a version that worked on the selected folder. We edited the code to change the selected contacts in any folder. Note that you do need to select the contacts, not just the folder. This code sample is an edited version of the previous code and works on the selected folder. I tested it in Outlook 2010 but it should work in all versions that the original code works with. This is the same code that is in the text file on page 1. To use, you need to select the contacts. Use Select All (Ctrl+A) to apply it to all contacts in a folder or use Ctrl+click to select some contacts. Doesn't work on "Suggested Contacts", but works great on "Contacts". Any tips on modifying the code? When I imported the outlook data file, some of my contacts' home addresses ended up showing as business addresses. Any way to convert those addresses from the business address column to the home address column? You can use the macro - just change which fields you are swapping. Thank you SO much for this code. worked like a charm! Yes it is. Actually the First Name field holds the company name, and the Last Name field holds the fullname. So based on the First, Last "File As" configuration I should get a "Company (First Name), Fullname (Last Name)" presentation which I don't. Actually I don't understand how the company is added again at the end of the 'sentence'. Also inside the contact I get the option to correct the "File As' and have it displayed as it should. Thanks again for helping. Hello Diane and thanks for taking the time to reply. I 'd like to add some more details on the matter. The contacts are inside a public folder so they are distributed to all people of the company I am working at this moment. When I make the initial import to a local Outlook Contacts folder the information is displayed normally as should (in the address book) but... when this folder is copied to the public folder's mailbox on Exchange and is being retrieved through there, then the address book 'File As' is being changed to that strange format I described above. I have done the import many times with all possible combinations and all times I experienced the same behavior...correct 'File As' locally, altered when retrieved from the Public folder. Regards. what type of email account? I've seen behavior like this with outlook.com accounts. It's an Exchange 2013 account. What puzzles me is that the above presentation (First, Last, Company) isn't defined anywhere in the Outlook options. Shouldn't the 'File as' behavior for bulk importing contacts be the one set in the Outlook options, so 'First, Last Name' as I have already chosen? Also when I edit the Outlook properties I get the option of setting it (manually) AS it should be. Thanks. I tried running your script on the selected contacts folder with the .Firstname parameter selected but all I got is the same result. That means the name and company are all in the first name line. Click the Full name button to check. .MailingAddress = .BusinessAddress simply copied the address information from .BusinessAddress to .HomeAddress (which was the defaulted .MailingAddress).